Built for busy, on-the-go professionals, the ultra portable PowerLite 1785W projector features wireless widescreen performance, plus convenient Miracast streaming. This ultra thin 4 lb model provides 3,200 lumens of color brightness, 3,200 lumens of white brightness (1) and WXGA resolution — ideal for HD-quality content. 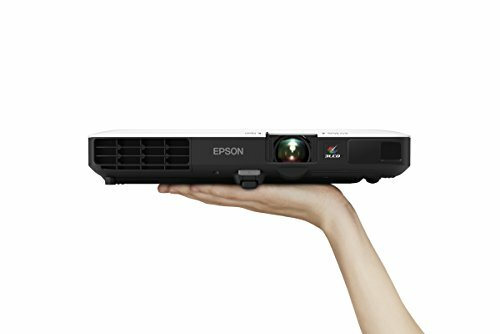 Offering 3x Higher Color Brightness (2) than competitive models, Epson 3LCD projectors ensure vivid presentations. Featuring Miracast, the latest in wireless connectivity, the 1785W can mirror content from a smartphone or streaming device (3). It also supports Chromecast, Roku and MHL-enabled devices. And, its auto horizontal and vertical keystone correction offer fast, easy image adjustments. 2. Color brightness (color light output) measured in accordance with IDMS 15.4. Color brightness will vary depending on usage conditions. The projectors used by a third-party lab for measuring color brightness were leading Epson 3LCD business and education projectors and leading 1-chip DLP projectors, based on NPD sales data for June 2013 through May 2014 and PMA Research sales data for Q1 through Q3 2013. Look for two numbers - 3,200 lumens (1) Color Brightness for more accurate, vivid color and 3,200 lumens (1) White Brightness for well-lit rooms. Vibrant widescreen images - WXGA resolution (1280 x 800) for widescreen HD performance. Wireless - project from your laptop, tablet, or smartphone (3) without plugging into the projector, so you can move freely about the room. Far more accurate color with Epson - 3LCD, 3-chip technology for 3x Higher Color Brightness (2) and up to 3x Wider Color Gamut (4) than competitive DLP projectors.